One of he most familiar faces over the last 50 years at Lakeland, Border and Yorkshire Dales Sports meetings, and indeed Highland Games, has been that of Roger Ingham MBE. Born in Skipton on March 7th 1944, and still living there, his life has been dedicated to the pursuit of excellence in sport. His introduction to competitive sport came in 1951, when he and school mate David Jeanes qualified to run in the Skipton and District Schools 'Festival of Britain' Sports Finals. David won their event, but Roger was unplaced. His first taste of sport outside of school events, took place the following year in the Skipton Swimming Championships, held at the open-air swimming baths in Shortbank road, where the 'Shortbank Olympics' are now held. Four years later, in 1956, he became the Craven Youth Swimming Champion and reached the semi finals of the Yorkshire Schools Championships. Other sports he became involved in, both as a competitor and coach, included football, rugby union and boxing which he took up after leaving school. 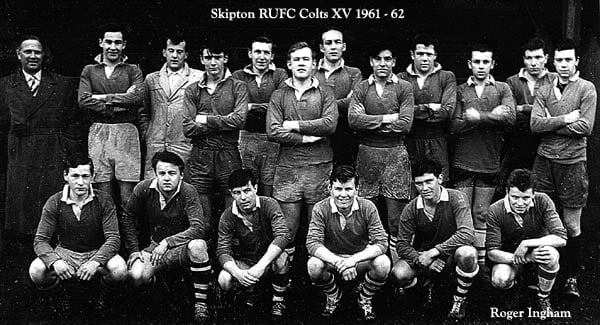 He prefers rugby league to rugby union, but Skipton had no amateur RL team then, and he has remained a staunch supporter of this code throughout his life. David Jeanes, with whom Roger also played football in the school team, had already been travelling to Lakeland and Dales sports meetings, and would come back regaling Roger with awe-inspiring tales of the great Bill Teasdale. 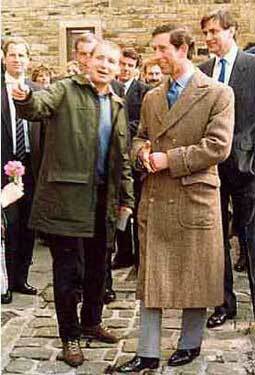 Roger eventually got to meet Bill when he hitchhiked to Kilnsey Show in 1957. David incidentally, went on to play in the 1968 Rugby League Cup Final at Wembley, and also won a gold medal at the 1972 Rugby League World Cup Final in France. 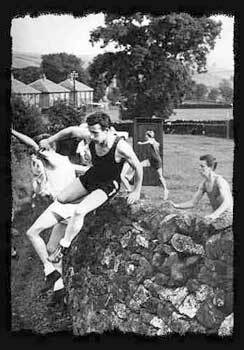 Roger made his fell running debut at the age of 13, at Clapham Sports in 1957 - and finished last. The following year he competed in the Craven Youth Cross Country Championships over an undulating, snowbound course that seemed more like a fell race. 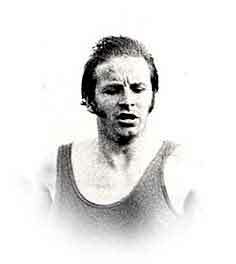 He finished second to John Longstaff, a prominent junior fell racer who later made a reputation as a track runner when he moved up into the senior ranks. 1959 saw Roger achieve his first ever win as an athlete, when he improved on the previous year's second place, to take the area title over a demanding Wharfedale course at Grassington. Later the same year he hitchhiked to Dent Sports, but finished last in the fell race up Rise Hill, which also included an each-way crossing of the River Dee. He had now begun to compete on a regular basis, but as he himself admits :"I didn't have much success as a junior". The retired fell runner Billy Pickering coached him from 1958 to 1964, the year that Pickering, who was a Dales farmer, died. 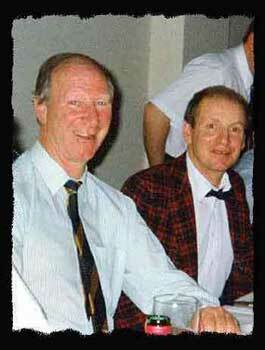 "Billy virtually lived for the sport", says Roger, "He did more to promote fell racing than anyone I know, and contributed a lot of money over the years out of his own pocket, towards prize money and expenses". 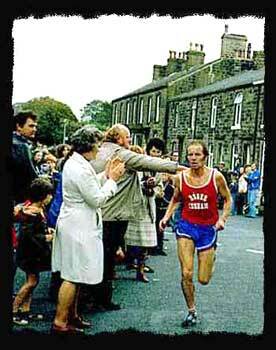 Pickering's coaching finally paid dividends in 1962, when Roger won his first senior fell race at the age of 18. This was at Pool-in-Wharfedale, actually an amateur event, though not run under AAA rules, and he scored a consecutive hat trick of victories there against mainly club runners from the Leeds and Bradford areas. Another early victory came at Black Lane Ends, on the low moors north east of Colne, against similar opposition. Despite breaking his leg in 1965, Roger won more than 130 races including track, fell and cross country and even the odd road race or two. 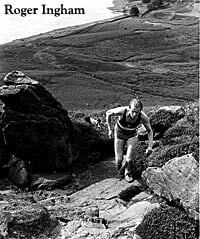 Two of his best fell runs in 1978 were at Preston Patrick and Buttermere. "At Preston Patrick I won the inaugural race up Scout Hill, starting from the front of the late Philip Robinson's farm. An unusual factor of the race was that to win it, I overtook Tommy Sedgwick on the descent, and held him off on the run-in". 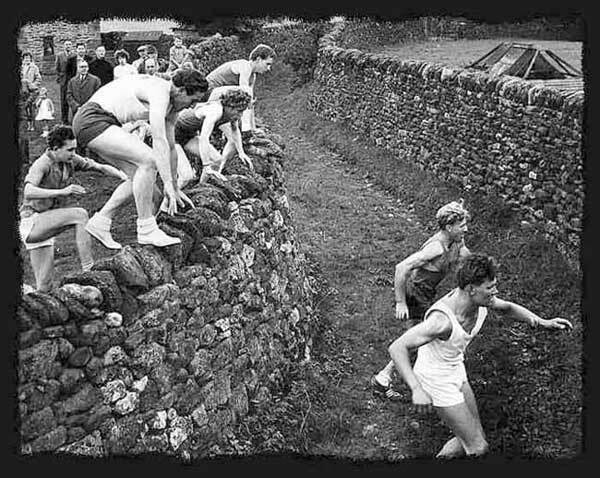 (Scout Hill also served as the turning point for the fell race at the old Lupton Sports.) "I would gladly have swapped that achievement though, to have done the same at Buttermere Shepherds' Meet later that year. I never won a race to a height of over 2,000 feet, but I came close to it that day. Leading narrowly at the summit of Robinson, and with Scout Hill in mind, I launched my descent, determined to defy Tommy again. Wishful thinking! Tommy flew past; crashed heavily - which gave me another bite at the apple - but as I almost caught up with him, he bounced up, rumbled forth, never to be seen again. I still held onto second though"
Another highlight of that season was Roger's victory at Walna Scar Shepherds' Meet, held that year at Torver, where he ended Fred Reeves so-far-unbeaten run. He also won the inaugural Lunds Tower fell race at Cross Hills Gala, south of Skipton, and finished runner up to Reeves at Embsay, also near Skipton. 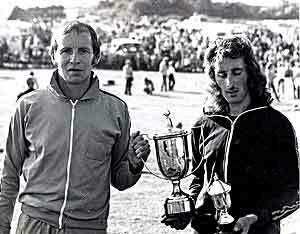 Roger won over 30 fell races in all, including some at Highland Games. His final victory came at Thoralby in Bishopdale, Yorkshire in 1992 at the age of 48. 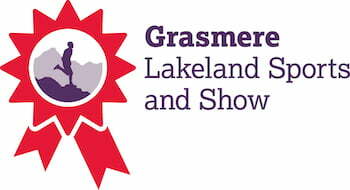 His fastest time for the Grasmere Guides race was in 1978 in a highly competitive race won by Fred Reeves in the record time of 12minutes 21.6 seconds, with Roger finishing 8th in a time of 13 minutes 51 seconds. However: "I had finished 7th to Reeves the previous year, when he clocked 12minutes 40 seconds, whilst I clocked 14 minutes. 9 seconds which in essence was a better performance - accounting for various nullifying factors - than my 13 minutes 51 seconds the year before". On the track at Grasmere, he won the 2 miles in 1970 and the 1 mile in 1973. "My best ever season ", says Roger, "was 1974 when I won the Lakeland Sportsman of the Year award, and triumphed in18 track and 2 fell races. The highlight was undoubtedly winning the 2 miles event at Braemar Highland Gathering when the Queen and other members of the Royal Family were present. I'd had no injury problems that season and was able to pursue my full training schedule from start to finish. The same applied in 1978 when I won 16 races on fell, road, track and cross country, plus the Kendal Sports Winter League Championship." Roger used to hitchhike to Lakeland, Dales and Scottish sporting events when he was younger and has in fact hitchhiked to sporting events all over Europe. "I once even got a lift with the Archbishop of Canterbury, Doctor Coggan," he recalls. One of his favourite British venues is Killington Sports, near Kirkby Lonsdale, where he ran the fell race on 40 occasions. 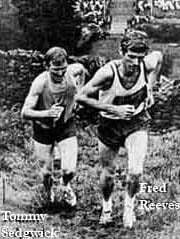 One year he and Fred Reeves were joint back markers in the Mile event and Roger won it from Fred, and then came second to him in the fell race, ahead of a young Kenny Stuart. 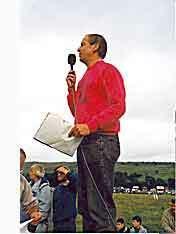 Roger commentates there now, as well as at Arncliffe, Buckden, Gargrave, Hellifield, Kilnsey, Malham and at the Three Peaks Cyclo Cross. At the Great Yorkshire Show, held at Harrogate and attracting crowds of up to 150,000, he provides a knowledgeable discourse on the sheep shearing championships. One of his finest pieces of commentary came at the Grasmere Sports in 1985, when he introduced a gathering of former champions to the assembled spectators. He has for many years contributed reports on fell racing and other sports, to the Craven Herald and Pioneer, as well as other local newspapers, purely as 'a labour of love' - in other words unpaid. 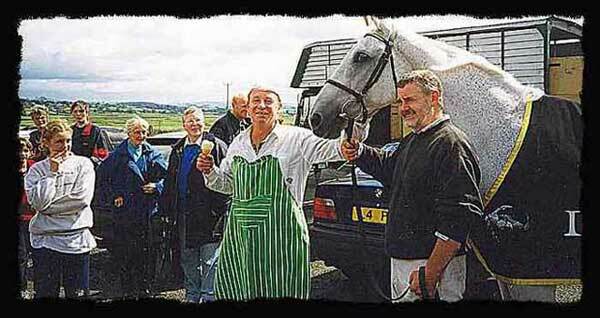 Assisting in the organisation of local fell races and other sporting events is another of Roger's pastimes. He is chief organiser of Skipton's 'Shortbank Olympics', which include a series of both junior and senior fell races climbing up to Rombalds Moor. All proceeds go to the Candlelighter's Children's Leukaemia cancer charity. He has coached in all the sports in which he has competed and has produced several champions, including former guides racer Mick Hawkins, who later became a Commonwealth Games 3,000m steeplechaser. 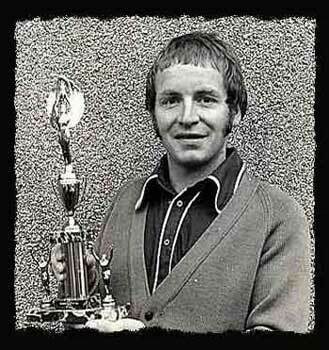 In the late 1970's Roger twice won the Craven 'Sports Personality of the Year' award during the 4 years it was held. In 1985, he became one of only 6 people to receive a special award from the Lord Mayor of Leeds - 'For services to Yorkshire, its image and its people'. He was also the recipient in 2002, of a prestigious award from the North of England AA 'For outstanding services to athletics'. In 2005, he won ITV's 'Local Hero' award, which led to him being presented to the Queen at Buckingham Palace. 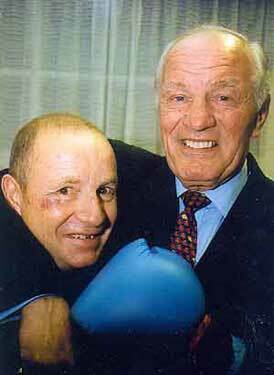 However his greatest achievement came in the January 2007 New Years Honours List, when he was awarded the MBE 'For Services to Sport in North Yorkshire' - a richly deserved and long overdue honour. He is now Chairman of Keighley Amateur Boxing Club and no longer runs due to knee problems, but he certainly believes in putting something back into sport!